Happy Monday morning everyone! I hope you had a wonderful weekend. The weather here is a bit gray today, so I thought I'd start off the week with a cheerful card for you. What could be more cheerful than Cupcakes?! Especially chocolate ones? Yumm! This card is a 5 1/4" inch square, made to fit our Medium Square Envelopes. The base is Whisper White and the layers are Pretty in Pink and Chocoate Chip Cardstock. 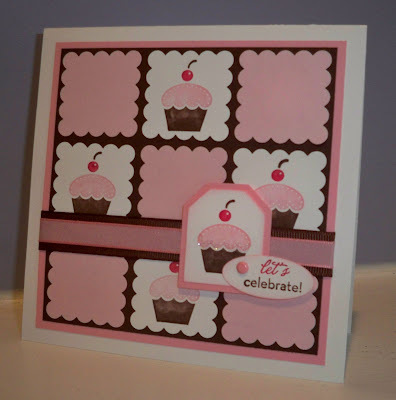 I got out my Scallop Square Punch and punched 5 squares from Pink Pirouette cardstock and layered them in the corners of the Chocolate Chip piece. The middle one was placed last after I had adhered the cupcake squares. Those were created with this adorable cupcake image from the Darling Dots stamp set which is a Hostess Level 1 set. Too cute! Using my Stampin' Write Markers in Chocolate Chip, Pretty in Pink and Rose Red, I colored directly on the stamp for the multi-color image. This was stamped 5 times, re-coloring each time, onto Whisper White Cardstock. I punched 4 of them out with the Scallop Square Punch and completed my grid on the card front. The 5th cupcake was punched out with my Small Tag Punch which was then layered onto a piece of Pretty in Pink cardstock punched out with my Large Tag Punch. I really love how my Stampin' Up! punches allow me to easily created these layered looks. After adding a little bit of Dazzling Diamonds to the tag cupcake - the frosting just had to sparkle on this one! - I went to my "On Your Birthday" stamp set and used the little "Let's Celebrate" stamp for the greeting. Markered in Rose Red and Chocolate Chip, I then punched it out with my Small Oval Punch. It was sponged a bit around the edge with Pretty in Pink ink and a Stampin' Sponge. The greeting is attached to the tag with a pink brad from the Soft Subtles package. This was attached to the card with two Stampin' Dimensionals. The ribbon accent is simply Chocolate Chip Wide Grosgrain and Pretty in Pink Taffeta layered together and wrapped around the front of the panels underneath the greeting. This one was a bit time consuming, but oh, so fun and pretty to look at when it was finished! Another one that just makes me smile! Well, gotta sign off here for now, I have prep work to do for my Just Cards classes tomorrow. We are going to have some St. Patty's Day fun making cards at 10 am and 7 pm. If you are not signed up, I still have a few spaces left in both classes, but let me know asap so I can plan for you! This card is probably one of the ones we will be making! And my friend, the gourmet baker Lissa is making the sweet treats for both classes tomorrow - I know you don't want to miss that! LOVE LOVE LOVE IT!!!! (I'm a sucker for cupcakes!!) This is one that I will definately be CASE'ing!!!! You rock! Hope you have a happy Monday!!! Great card! I linked to it on my blog, hope you don't mind! Very cute! Thanks for reminding me to use my tag punch! That one has gotten buried under all of the new ones!! I love this one! I am definitely going to CASE it!!! I LOVE this card! You know I came home from the party and made one that day! I think we will do it for stamp camp this Friday! Thanks for a great idea! OMG i LOVE this card!! too too cute!!! This is too stinkin' cute!!!! See ya in Hawaii soon! !